The Ford Mustang is, without a doubt, the most well-recognized of American automobiles. It’s the sports car that started the pony car segment and one of the most-produced vehicles of all time. The Mustang is often credited as the car that made Ford cool again. In his book, our very own Jimmy Dinsmore chronicles the parallel stories of the Mustang’s creation and the man most responsible for the pony car’s appearance: Gale Halderman. Lee Iococca, then Ford’s Vice President and General Manager, is most often credited (and rightly so) as the person most influential in getting the Mustang approved and into production. The car, along with the Pinto that came afterwards, undoubtedly made Iacocca’s career. Yet it was Halderman’s grease pencil sketch that inspired the Mustang and his hard work on the car’s design team that produced the first generation of the car and, ultimately, its success. 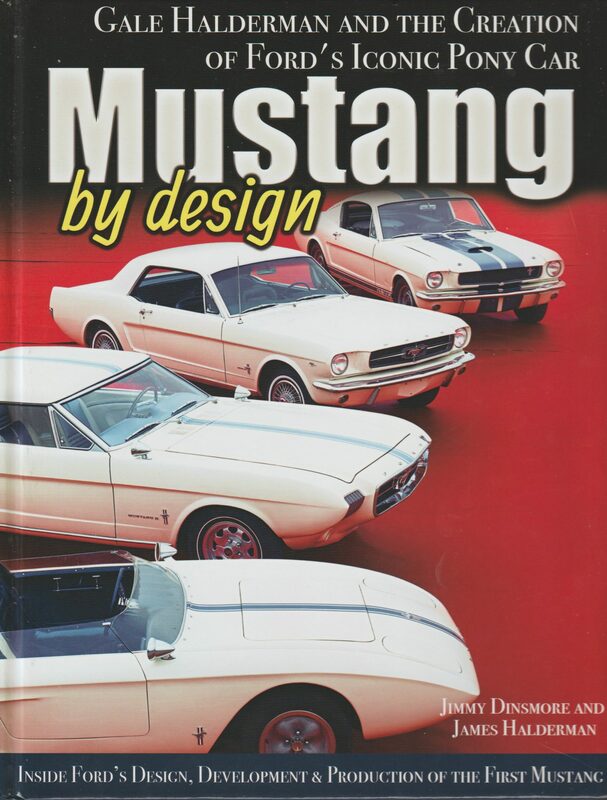 Dinsmore’s book is a side-by-side look at the design, development, and work that went on to create the Ford Mustang. And, just as importantly, to get it approved for production at a time when Ford’s president, Henry Ford, II, was not interested in newfangled ideas. Unlike other books chronicling the Mustang, however, Mustang By Design focuses on the more personal side of things. Especially with Halderman, one of the design geniuses at Ford during the 1950s and 1960s era. Using interviews, family recollections, and items collected in the Halderman family barn, now a museum in Ohio. 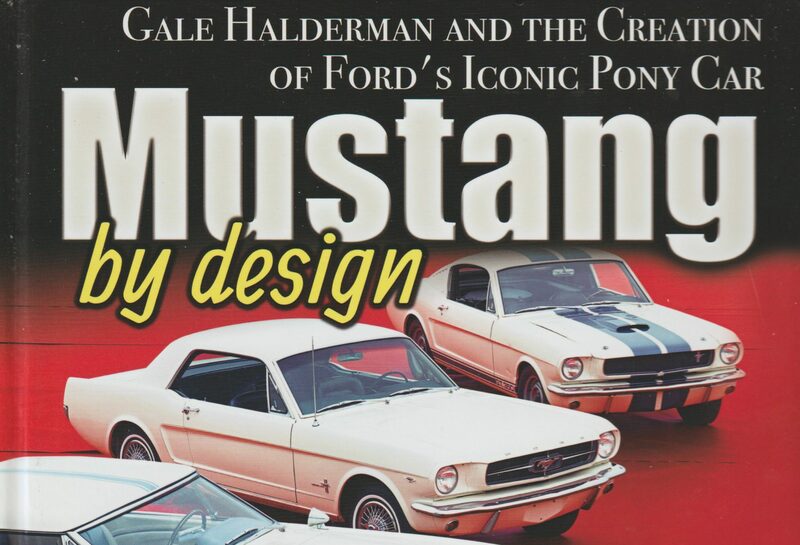 No small part of the book’s in-depth look at the Mustang’s primary design influencer comes from its co-author, James Halderman, cousin of Gale. The focus of Mustang By Design is, of course, on the Ford Mustang itself, but Halderman worked on many vehicles during his four decades at Ford. The book outlines some of those as a way of giving context to the work on the Mustang itself. Like most designers, Halderman was working on any of a half dozen or more projects at any given time. Some were simple “bread and butter” jobs, others were serious overhauls of existing models, and some were fully new models in development. That context serves to show why the Mustang was not widely regarded as a realistic or important project at Ford at the time. They also show why it is that Ford’s design during the 1950s and 1960s is a testament to the talent of those working in Ford’s design departments. Despite working on literally hundreds of vehicles during his tenure at Ford, Halderman and those like him managed to produce unique, well-engineered, thoughtful designs that have become collectors’ dreams today. The Fairlanes, Galaxies, and Thunderbirds of the era are staples at today’s classic car shows. All thanks to the prolific and imaginative work of designers like Halderman. The important story of the Mustang has been told many times, of course, and usually from the perspective of Iacocca or Gene Bordinat (chief designer of the Mustang I concept). Sometimes from the perspective of engineers like Herb Misch. This is the first I’ve seen where the focus is instead on the car’s chief behind-the-scenes visionary. Halderman, despite becoming largely a footnote in most Mustang biographies, was likely the most influential person on the car’s design team when it comes to details and the daily flog work required to make a concept into a reality. In Mustang By Design, Dinsmore and Halderman’s kin manage to tell the story of both the iconic pony car and one of its creators in such a way that the human side of the story is foremost. This gives much-needed context to the mythos and background of the iconic Ford Mustang. 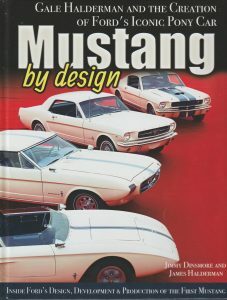 You’ll find Mustang By Design, published by CarTech, at book stores and online.